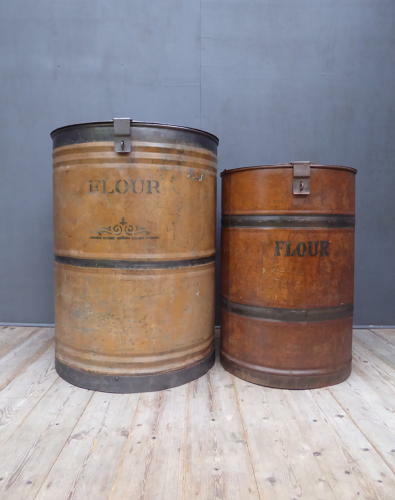 Two beautiful antique country house flour bins of monumental proportions. These large tole flour bins would have been used in a country house to store of flour in bulk before it was moved into smaller canisters for use in the kitchen. Both feature original paint & signwriting, iron banding & hinged lids secured with hasps which could be secured using a padlock. The larger bin is the biggest one I've seen to date & both display beautifully. Larger bin dates to around 1900, smaller one slightly later. Wear commensurate with age as pictured, both very good overall. Unrestored. The smaller bin has one of the soldered seams on the lid deoration coming away slightly, this is non structural, remains secure & does not detract at all (see last image). Tracked UK courier service available at £18 for the smaller bin & £55 for the larger one (this bin is too large for my regular courier so will be sent via Parcelforce 48 Large).